The new version 1.15 of the TheBest Minimize to Tray is now available. Exceptions now work for 64-Bit programs, too. And you can choose to not automatically unminimize a program when it’s forced into the foreground. 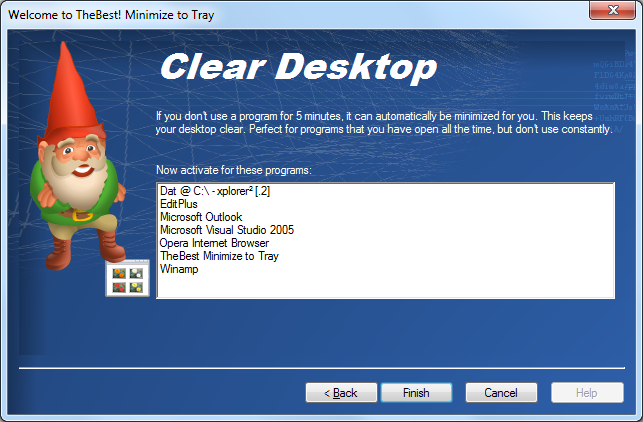 If you want to know, how you can minimize any program into the tray, check out our program. The new version 1.10 of our software TheBest minimize to tray is now available. It fixes some minor issues and now includes the new “Clear desktop” wizard which is automatically shown during the first start. This wizard makes it even easier to minimize selected programs automatically when they’re not used for a certain time. More information about the program can be found on the minimize to tray page. The new version 1.06 is here, with two interesting improvements. We’ve improved capatibility with Outlook when minimizing it to the tray. And you can now define a hotkey to minimize apps to the system tray. You can find more info about the program on the TheBest Minimize to Tray homepage. We’ve just published version 1.05 of our minimizer application. If you had any trouble with the installation, please try the lastest vresion of TheBest Minimize to Tray. Today, we’ve released version 1.03 of our software TheBest Minimize to Tray. There are little changes, only a minor bugfix for Vista. If you had troubles with the desktop icons, please get the new version. We’re going gold: Version 1.0 of TheBest Minimize to Tray is out. Now you can hide any application in the system tray. Manually with a mouse click or automatically if you don’t use the program. Get more space on your desktop! Yes, it’s finally out. Our new little tool to minimize other programs to the system tray. Why we wrote it? Because the world needs it, we think. Yes, there are already other programs out which do something similar, but they don’t work very well, are cumbersome to configure or lack features. At least we didn’t find any that we wanted to use ourselves. And it IS really useful. Finally the taskbar is a bit more “clean” and the programs that currently aren’t needed, are minimized into the tray (shown as an icon next to the system clock). You can try it for yourself: Get the demo of TheBest Minimize to Tray. Not much is posted here, as we’re quite busy with a new application. Can’t tell much yet, but it involves the system tray.